So I don’t know if it’s just the introvert in me, the fact that I’m talking to people 10+ hours a day or that I haven’t had it in forever, but I can’t tell you how much I’m enjoying my “alone time.” And before we go any further, please get your head out of the gutter because I’m referring to my quiet, humble abode. 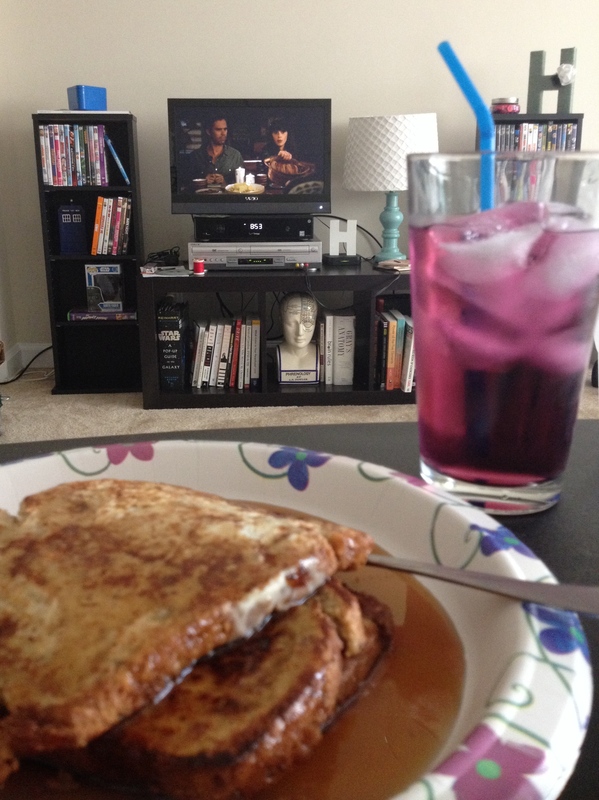 Because Saturday’s are now for homemade breakfast and “New Girl” marathons. Working in a hospital and having over half of my job include calling people, I am absolutely people-drained by the time I set foot onto the metro home. By the time I hit the threshold of my apartment, the shoes come off, I jump into some comfy clothes and I take a deep breath… because entering that door is entering serenity and I embrace that quiet like no other. Also, given that Washington D.C. is a big swampland, it holds that humidity like crazy and I usually spend the first five minutes hanging out by the air conditioning; trying to cool-down after hanging out on a train with a bunch of strangers and no air conditioning what-so-ever. It’s a glorious smell if you know what I’m talking about and by glorious I mean horrendous. But again, I’m not complaining because my commuting time has been cut by two-thirds, it’s just a mere–and accurate–observation. I haven’t gotten used to the extra time either: What do I do with myself? Do I do laundry? Do I work out? Do I do some unpacking? Or maybe just sit here and watch 10 episodes of “New Girl” because I can and no one can tell me not to? It’s a complicated game in the evenings. The mornings have been amazing though. I’m still in shock and awe of having time to COOK breakfast in the morning and sit with a cup of coffee, or in the case of hot, summer days, a nice glass of ice-cold energy juice. I’ve even had time to curl my hair. I don’t even know you guys, it’s crazy. Decorating was quick in the beginning and has since slowed. I’ve been sketching out what I want to do and then come back and go “Eh, no.” It’s rough. Instead of thinking so much about it, I’ve just been going for it: today I put up a bulletin board in my kitchen along with a housewarming gift from my brother and his girlfriend… because wine is everything and no one can tell me any different. I love my new calendar printables that I found from Love vs Design (the jewel 2014 calendar) and my monthly calendar from Elli. Definitely check them out! Love vs Design has so many other templates for the year-long calendar, but this one just called out to me and the month design reminded me of my current blog layout. I knew I had to have it! Despite my uncertainty with the decor, I do have some wall art ideas for the horizon and I can’t wait to share those with you!